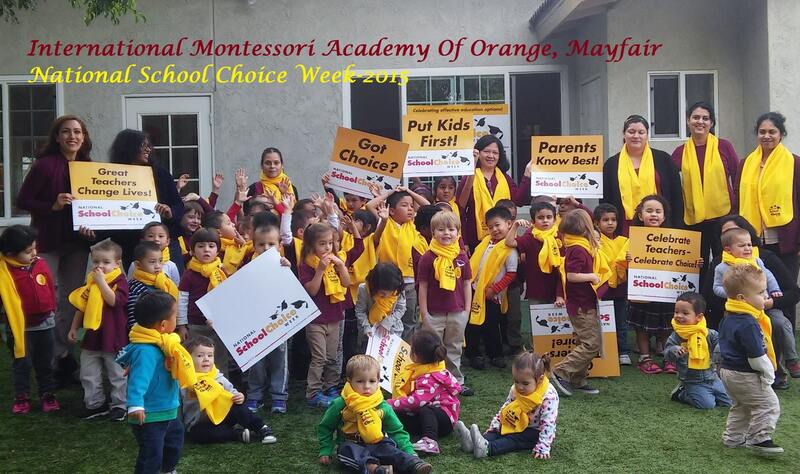 Welcome and thank you for your interest in International Montesorri Academy located in the city of Orange! Our Montessori Academy recognizes the potential of every human being. We are especially trained to recognize the potential of young children and his/her desire to learn and nuture curiosity. It is a privilage to share precious moments which roll into years of learning experiences with our community and the families we serve. We believe in the whole child by implemening the beautiful and meaningful Montessori methods as taught by Dr. Maria Montesorri herself! We are greatful that you have choosen to visit our website and encourage you to stop by to meet our Staff and visit our prepared environments - We consider it a gift to share our school and spend time with one another. It is our wish that we have the opportunity to grow together and enrich the lives of our young children - which are indeed our future! Tours are welcome Monday - Friday ~ ASK US ABOUT OUR LIMITED OFFER FOR NEW FAMILIES ENROllING AT ICMA - Save up to $100 a month (details apply). - WHERE WE LOOK FORWARD TO SHARING THE NATURAL PROCESS WHICH DEVELOPS SPONTANEOUSLY IN THE HUMAN BEING! "ARE YOU A NEIGHBOR/ WORK IN THE AREA? Do we share a zip code... - WE LOVE OUR COMMUNITY" - COME IN AS A NEW ENROLLMENT & TAKE $50.00 OFF OF THE POSTED TUITION!!! "ARE YOU SERVING IN THE MILITARY? THANK YOU FOR YOUR SERVICE!!" COME IN AS A NEW FAMILY & TAKE $50.00 OFF OF THE POSTED TUITION!!! "ARE YOU A TEACHER, PLANTING SEEDS FOR TOMORROWS GARDEN OF LIFE?" you ARE WELCOME AND INVITED TO A $50.00 DISCOUNT OFF OF THE POSTED TUITION!!! MENTION THIS WEB PAGE!! DETAILS APPLY - EXPERIENCE THE DIFFERENCE OF "OUR MONTESORRI FAMILY -"
Tours are welcome daily!! Please contact us to set up a tour. We enroll children all year long - as long as space is available. Our school is open 12 months a year, Summer, Spring, Winter and Fall! International Christian Montessori Academy of Orange, is a campus with cultural diversity in our staff and student body. Our beautiful campus has been in existence since 1982. We are open 12 months a year. Our Primary programs (Preschool) serves families with children starting as young as 18 months old through 6 years old - . Our campus is conveniently located near the cross streets of Tustin & Mayfair, near the 55/91 & 22/5 freeways. Intimate and academically prepared classrooms are overflowing with stimulating activities that encourage support and understanding of the Montessori method of learning. Qualified and loving staff members facilitate a safe, social, spiritual and academic opportunity to grow in. English, Spanish and French languages may be included throughout the day in conversation and curriculum. Additional After school Enrichment programs are offered - Please check with the school office for more details. Some examples may include: Piano, Computer, Dance, Soccer, Yoga, Physical fitness. Large leafy trees shade a spacious playground. Play structures, sand areas and grassy yard space meet a variety of childrens interests. These help to provide plenty of social and educational opportunities in the outdoors. This allows safe and engaging exploration, which includes both meaningful and cooperative play opportunities. Socialization is encouraged and easily achieved in our friendly environment both indoors and out. We are a secured school campus, with an open door policy. Parents enter and exit to observe their children as desired, under the supervision of our Staff. Guests are always invited. Drop in, tours are offered to the community, or you may schedule an appointment if desired. All guests enter and exit at the front office, only authorized individuals are allowed on the porperty. We have many large observation windows located all over the school, for your pleasure. We take pride in our children and the program we offer! We'd love to have you visit! Mention this Web page before enrolling and learn about our enrollment offers! Come experience the tradition of International Montessori Academy, where we believe in "Nurturing young minds while keeping the spirit free!" Menu / "Optional school lunches & snack menu"
Our curriculum is specially designed to address the developmental needs of children as individuals and help them to grow at their own pace. Each classroom is equipped with a variety of Montessori material designed to develop the child’s individual skills in the following areas: Practical Life, Sensorial Education, Mathematics and Geometry, Language, Geography, Social Studies and Science. ALL Enrichment programs/ Extra Curricular activities are after the Academic school day. All children wear ICMA school uniforms, during the Academic shool year. Uniform Information is available on site. Enrollment is open any time during the year as long as space is available. The school is open from 7am to 6pm, M-F. Begin after the school term ends - Please see our Camp Calendar at the school for dates and Themes. Summer Activities include: Limited Montessori work and academics, singing, story time, arts, crafts, Vendor shows, possible field trips, etc.